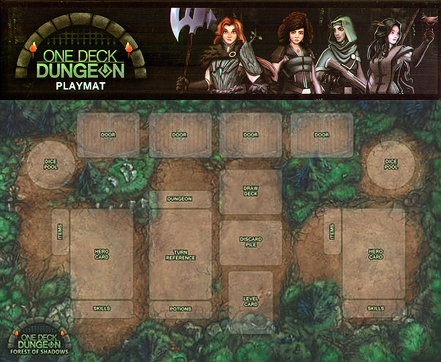 This playmat for One Deck Dungeon is a 24" x 14" Neoprene mat. It has slots designed to accommodate a 1 or 2 player game in an organized fashion, with spaces for the heroes, encounters, deck, discard pile, turn reference, dice pools, and tokens. The artwork for the playmat is forest-styled, to match the Forest of Shadows expansion, but the playmat can be used with the base game as well.